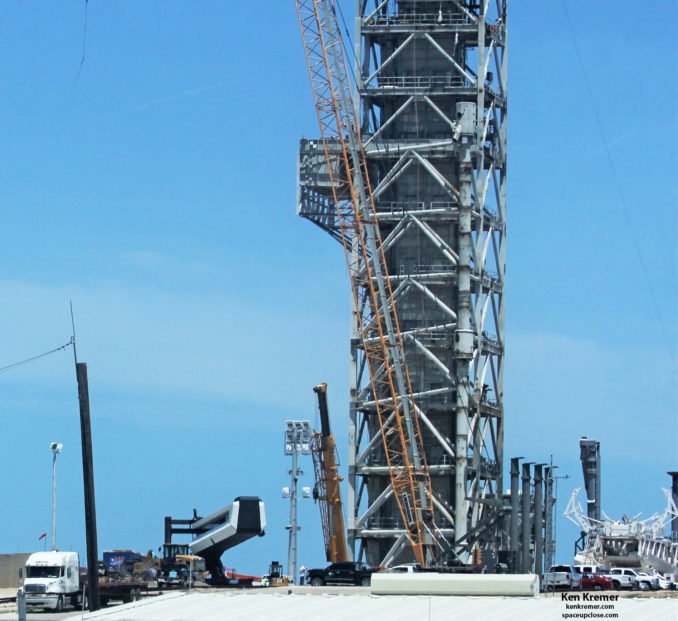 The crew access arm on the deck of launch pad 39A awaits its installation. 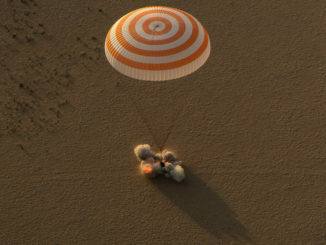 Photo: Ken Kremer/spaceupclose.com. 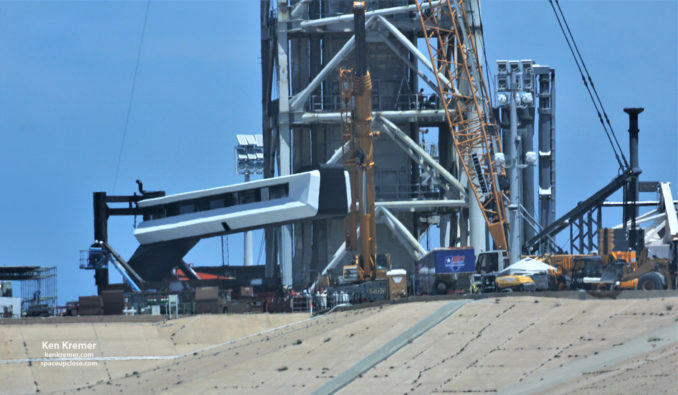 Photos of the access arm shared on social media show it arrived at pad 39A earlier this week. 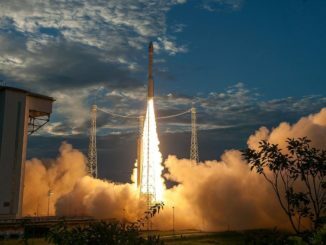 SpaceX will raise it to an attach point on the launch pad’s fixed service structure at the correct height to give astronauts and ground crews access to the Crew Dragon spacecraft sitting atop a Falcon 9 rocket. Spaceflight Now Members can watch a live view of pad 39A. Become a member today. At the end of the arm, a white room will connect to the hatch entry way of the Crew Dragon spaceship, allowing astronauts to crawl aboard a few hours before liftoff on missions to the International Space Station. A crew access arm similar in function — but different in appearance — has been installed at United Launch Alliance’s nearby Atlas 5 launch pad at Cape Canaveral, where Boeing’s CST-100 Starliner commercial crew craft will lift off with astronauts on-board. Multiple cranes are in place to lift assist in the installation of the crew access arm. 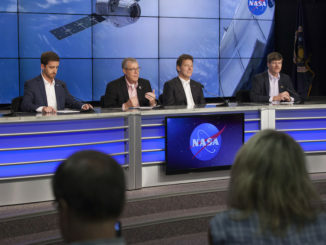 Photo: Ken Kremer/spaceupclose.com. SpaceX plans to have the access arm in place and tested in advance of the Crew Dragon’s first unpiloted orbital demonstration flight, known as Demo-1, set for launch in November. The Crew Dragon’s first test flight in Earth orbit with a two-man crew on-board is scheduled for April 2019, followed by regular crew rotation launches to the space station.